This development, just completed and fully let, comprises the conversion of the existing (part medieval) Oude Stadhuis (Old Town Hall) into offices plus the addition of a new two storey retail development on the site of the 1970's Council Chamber. The Council Chamber was built in the 1970s on a triangular site behind the Oude Stadhuis in the heart of the old quarter of The Hague. Its rough concrete facades , laid out at odd angles to the existing street pattern, had never been cherished and when the new Town Hall was built half a mile away the opportunity arose for a unique addition to this already thriving shopping area. Our design for MAB positions a circular building, The Rotunda, at the apex of the site, where it fronts onto the Vene Straat, a main shopping street, The Bonneterie, the famous Department Store, and The Golden Head, the equally famous eating house. The Rotunda acts as the main entrance/stair hall for the large first floor department store. It features multicoloured brick columns and a glazed clay tile roof. The other flanks of the scheme contain 10 shop fronts, with windows over. These facades cut back to reveal the fine facades of the Oude Stadhuis and create small entrance courts. 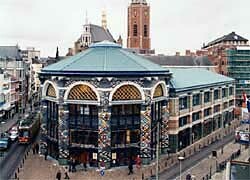 The one on the south Groenmarkt) side contains the entrance to the office suites and the large basement restaurant. The court on the North (Grotte Halstraat) side frames the entrance arch and ramp down to the large public Cycle park in the basement. Works to the Oude Stadhuis are slight and involve the insertiion of a new entrance hall and stair to give flexibility in the letting of the office space on the upper floors. The magnificent ground floor interiors are to stay in use as a Registry Office for the City. The project has been enthusiastically received by the local and national press, and was fully let before completion. 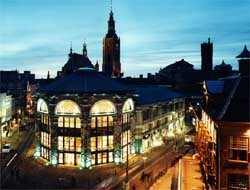 - Oude Stadhuis : 3,900 sq.m. - Retail: 2,863 sq m.